A health pack in Halo 2: Anniversary. A health pack is a first aid kit containing the standard combat wound treatment, which is used by all UNSC combat personnel, ranging from Marines to Spartans. Each health pack contains biofoam, a stitch kit, polypseudomorphine, self-adhering antiseptic battle dressings, and other useful components. Health packs are standard requirements aboard many UNSC ships for medical emergencies. Health packs are often seen on corridor walls at regular intervals. There are also two health packs located in a Pelican. Both of them are on each side of the door to the cockpit. They are rectangular in shape and are inaccessible to the player. Health packs are present in Halo: Combat Evolved, Halo 3: ODST and Halo: Reach . In Halo: Combat Evolved, the health pack would fill the player's health, but would have no effect on their shields. In Halo 2 and Halo 3, health regenerates with an integrated biofoam dispenser within the new MJOLNIR Mk VI. In Halo 3: ODST, the health packs are dispensed from Optican medical kiosks and they use a privately-manufactured healing agent known as MediGel. 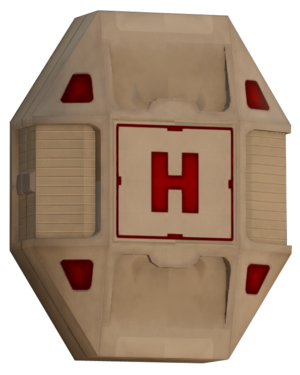 In Halo: Reach, the health packs are nearly identical to those seen in Halo: Combat Evolved, but with a red uppercase letter "H" instead of the red cross. When a health pack is picked up, the player will become momentarily blinded by a white flash. However, this goes away instantly if the player passes through a teleporter. The reason why the red cross was removed from health packs is that the International Red Cross objects to the use of red cross symbols in inappropriate contexts. In 2006, the Red Cross took the position that use of red cross symbols in video game "health kits" is inappropriate, and game developers ceased using them. In Halo: Reach, a health pack also regenerates the player's shields. The player cannot pick up a health pack if their health is full but their shields are down, such as when playing with the Black Eye skull. This can be circumvented by damaging oneself, such as with a grenade or a plasma pistol overcharge fired at close range. A Health Pack from Halo: Combat Evolved. The health packs found in the Pelican dropships. Though the concept was scrapped for Halo 3, this image shows the internal components of a Health Pack, helping bring realism to its healing effects. An Optican first aid station, as seen in Halo 3: ODST. Optican MediGel product application label in Halo 3: ODST. An Optican health pack in its socket from Halo 3: ODST. An in-game preview of the health pack in the alpha build of Halo: Reach. A health pack seen in the Halo: Reach Multiplayer Beta. A health pack in Halo: Reach. What the Halo: Combat Evolved Health Packs looked like in the pre-release testing disc.